The web originated with generalists - webmasters designing, building, and developing. Today, a web team can have a dozen different specialist roles, each highly-focused. With that in mind, what are the strengths of specialists and generalists, and when are each put to their best use on a project or in an organization? We all know web design tricks to getting people to do what you want – make buttons bigger, use accent colors, etc. There are other strategies, however, that rely on the more proven tools of psychology; this session will explore reciprocity, scarcity, and more, and see how effective they can be. 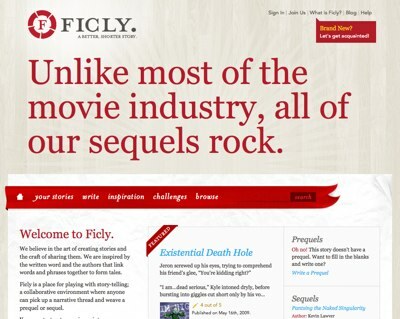 In other news, our client Ficly has been nominated for a SXSW Web Award in the CSS category. You might recognize the design work. It's a project we're real proud of and we'll be pulling for our friends Kevin Lawver and Jason Garber to take home the award.